Summer party fun always consists of great fruit and fabulous fruit centerpieces. I recently came across this wonderful way to arrange fruit that replicates a catamaran boat. The boat itself is cut from the pineapple shell. Then it is filled with a variety of delicious cut fruit. 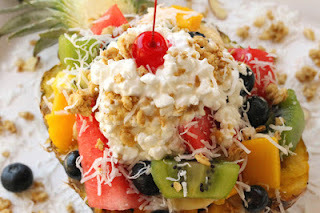 On Favored Cooking, Fay shows us exactly how to create this beautiful fruit masterpiece. It would be the perfect centerpiece for a summer party or cookout. The fruit itself makes a delicious and healthy appetizer or finger food. Any fruit dish is my favorite food at a party. Fruit is definitely the very best snack food! This particular Lanai Pineapple Boat centerpiece would be a lovely addition to the table, as well as a delectable treat for guests. Fay shows us exactly how to carve the pineapple so it will double as the serving dish. She recommends filling the boat with diced pineapple and other cut fruit. Then adding toppings if desired. She offers a multitude of additional fruit suggestions for your boat that are not shown in the photos, as well as a sauce recipe for your fruit salad. This really is a fun food that you can play with in your own kitchen to achieve the look and taste you desire. I have no doubt it would be a delightfully refreshing treat to serve during the hot summer festivities. You could even take it as your contribution to a dinner party. It would certainly be a welcome addition by any party hostess. Wow, does that ever look delicious and what a delightful centerpiece to a picnic or party. Yummy salads. I love to make salads in the summer.